Liverpool Rummy is a multi-player, multi-round card game similar to other variants of rummy that adds features like buying and going out. It's the same as Contract Rummy, except that if a player manages to cut the exact number of cards required to deal the hand and leave a face-up card, then the cutting player's score is reduced by 50 points. The game consists of seven deals of the cards. The objective is to be holding the lowest valued cards at the end of each deal. At the end of each deal the score for each player is written down, and the player with the lowest total score at the end of the seven deals wins the game. In each deal the players reduce the value of the cards held in their hands by laying on the table those cards that fit a specific "contract" of Sets and Runs. A Set consists of three or more cards all of the same rank, such as 8♥ 8♣ 8♠. A Run consists of four or more cards in sequence, all of the same suit (hearts, clubs, etc), such as 3♥ 4♥ 5♥ 6♥ 7♥. Note: The number of cards required to lay down increases by one with each hand, from 6 to 12. The game is played with multiple standard 52-card packs of playing cards plus the jokers (typically 2 decks for three to five players, 3 decks for more). The ranking from low-to-high is A-2-3-4-5-6-7-8-9-10-J-Q-K-A. Aces can be low or high. Jokers are wild cards and can stand in for any other card. Dealership rotates to each player from round to round. The dealer to the first round is usually determined by cutting the deck. Low card deals. The dealer deals a ten-card hand to each player. 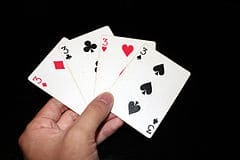 (In some circles, a 12-card hand is dealt, this variant is sometimes called Peruvian rummy) After all the players' hands have been dealt, another card (the upcard), is placed face-up in a central location known as the discard pile. The remainder of the pack is called the deck. The player to the immediate left of the dealer plays first. May allow any player to buy the top card from the discard pile. Draws either the face-up top card of the discard pile or one card from the deck. May lay down their completed round-appropriate collection of books and runs. May play off other players who have laid down once they have laid down themselves. May discard one card from their hand onto the discard pile. When a player discards a card that could have been played off on their own or another player's laid cards is a "liverpool." Only players that are LAID DOWN may call liverpool. The FIRST player to call liverpool may discard one card to the discard pile, resume rotation prior caller. If the next player commences their turn by either drawing or allowing buying then the opportunity to call liverpool has passed. Play continues, in alternating turns, until one player goes out, or has no cards left in their hand. Points are tallied and recorded by a score-keeper. All of the cards are shuffled and the next round of play commences. SETS: Books of 3 or more cards sharing the same rank, i.e., 8♥ 8♣ 8♠. RUNS: 4 or more cards of the same suit in sequence, i.e., 3♥ 4♥ 5♥ 6♥ 7♥. Aces rank as high or low, but one cannot create a run that loops around, also known as "turning the corner". A 2 3 4 is allowed, J Q K A is allowed, but K A 2 3 is not. After each player has finished their turn by discarding, if the next player declines to pick up the new top card of the face-up discard pile, any other player may "buy" it. The "price" of picking up this extra card out of turn is drawing an additional card from the face-down pile. If more than one player desires to buy a card, the player who is nearest (clockwise) the player about to draw gets precedence. The option to buy ends when the next player picks up a card from the top of the face-down deck. Jokers are wild cards, and can represent any card (suit and number). However there are restrictions on their usage. Sets must include at least 2 non-wildcards. Legal Example: 7♥ 7♣ Joker. Runs must include at least 3 non-wildcards in an original 4 card grouping. Legal Example: 7♥ 8♥ Joker 10♥. During their turn while playing off another player, a player may replace that other player's laid Joker from within a run with the card it is substituting, so long as that Joker is placed somewhere else before the player concludes their turn. An easy way to "waste" the extra Joker if it doesn't allow you to lay additional cards is to simply add it to a set, as this prohibits another player from performing the wild card substitution trick again. Once a player has laid down, they can then attempt to further reduce the number of cards in their hand by adding to other players' laid cards. If another player has laid down a set of 3's (3♥ 3♣ 3♠) and you have a 3 in your hand, you may lay it down on his pile. If another player has laid down a run of hearts (3♥ 4♥ 5♥ 6♥), you may add a 7♥ to their pile. Once a player has laid down, their discard must not fit into either their own or any other player's laid cards.If this is the case, every other player has until the commencement of the next player's turn to call rummy on the offending player, in which case that offending player picks up their discard and one additional card from the top of the deck. Once a player lays his cards down to 'go out' of a round, rummy rules no longer apply. Jokers are 20 points each. 2 through 9 are 5 points each. 10, J, Q and K are 10 points each. The player with the lowest point total at the end of final round wins, so players usually work to lower their scores by going down, playing off other players who have gone down and, secondarily, replacing high cards (such as face cards and aces) with lower ones. A player goes out when he successfully discards the only remaining card in hand, marking the conclusion of the step for all players. A player gets to this point by laying down and then playing off his and other players’ hands. A player is floating if he exhausts his cards and is not able to discard. In this case, the hand continues until somebody successfully goes out. At no point in time is it acceptable to draw a card from the up pile and discard the same card during the same turn. It follows that a floater must draw an unplayable card from the deck (down-pile) in order to go out. It is customary to knock on the table when there is only one card left in your hand. This alerts other players of closeness to going out. Me derives its name from a player out of turn buying a card from the discard pile. The player calls "me" and then picks up the discarded (bought) card and a penalty (the price for buying the card). The difference from Liverpool Rummy is that whoever calls "me" first gets the card as opposed to the player who is nearest (clockwise) the player about to draw.